Your wedding day is arguably one the most important days of your life. If there’s one time to be extravagant and over the top, this is the time. After all, you only get married once! There are so many aspects to wedding décor so it can be difficult to put all your ideas together and create your perfect day. One way to ensure your décor is a stand out, is to focus upon one main statement piece. This décor piece will become a focal point for your guests so it’s important it draws their eyes for the all the right reasons! A statement piece can dramatically enhance your overall wedding design and make your wedding unforgettable. 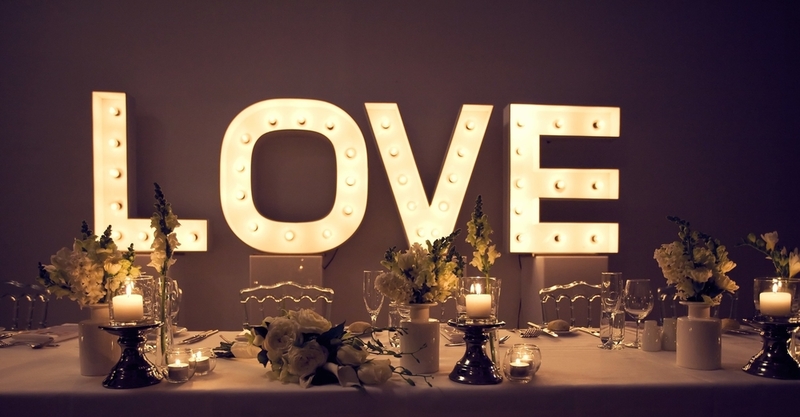 With this being said, here are our five top suggestions to incorporate a statement piece in to your wedding! Floral walls are definitely trending at the moment! There’s no wedding without flowers and they have become so essential that there are props being made from entirely flowers. Floral walls are a gorgeous addition to any wedding and can easily be incorporated in either your ceremony or reception (or both!). An ideal place for a floral wall to be placed is behind the bridal table thus creating a focal point for your guests on the night. Adding a pop of colour to the flowers will create a bright and magnificent statement piece. If a floral wall isn’t your thing, don’t worry; you can still create drama with a signature backdrop. Draping fabric and fairy lights can be used to create a beautiful statement piece behind your bridal table. One thing to keep in mind when executing this backdrop, ensure your backdrop goes from the top of the wall all the way down to the bottom behind your bridal table. If the backdrop is too short, it will look tacky and draw your guests’ eyes for the wrong reason! Hanging installations are absolutely breathtaking, if correctly executed. These are features, which can be suspended at the entrance, over your bridal table and over the guest tables. Imagine sitting down to your wedding reception with an exquisite foliage instillation above you and your groom. The installation is engrossed with dangling baubles with candles at various lengths creating a romantic and ambient atmosphere for you and your guests. You can add flowers as well to your installation or just keep it all green; whichever represents your personality, style and overall wedding theme the best. Lighting is so important at a wedding and can single handedly transform a space. The use of up and down lighting can further showcase and highlight a particular feature. For example, adding an up light on your floral wall with highlight the backdrop and make it stand out even further! Large and lavish floral centrepieces add so much charm to a wedding table. Tall, silver vases bursting with fuchsia orchids with dangling strands of crystals will demand the guests’ attention while giving the table a luxurious feel. There you have it, by incorporating one of these statement pieces in to your wedding, it will be a day that you and your guests will never forget.